IIoT early adopters are reaping the rewards. Are you missing out? The IIoT is everywhere. It’s the subject of countless industry articles; it’s on the agenda of every event; and it sometimes seems like it's all anyone can talk about. That doesn’t mean, however, that everyone has begun the digital transformation journey. Developing and implementing a digital strategy for your facility demands time, discipline, and a strategic vision, but the result can be a business better poised for success in an evolving manufacturing marketplace. Here are four reason why you should consider investing in IIoT initiatives. Cloud-connected "smart" tools can help bridge the skills gap for workers new to their roles by offering easy access to machine history data and related resources. In so doing, they can help plants realize the IIoT's potential to drive smarter, faster maintenance and business decisions. These tools often come in familiar forms that technicians are comfortable using and manipulating. The tools save time and offer never-before-possible ease of use as well as diagnostic capabilities. They also provide a path for lesser-skilled technicians to gain experience and improve their skills over time so that they can advance into more diagnostic and troubleshooting roles. 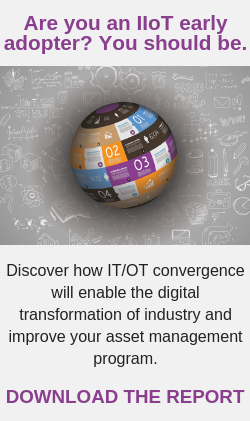 Many IIoT applications have moved beyond specific point solutions such as predictive maintenance of critical assets; they have become part of a broader digital transformation, says Ralph Rio, vice president at ARC Advisory Group. This includes new services and business models that require support from multiple parts of the organization, including product development, marketing, manufacturing, sales, and services. You don’t have to hire additional staff to achieve smoothly running operations in your absence. An outside vendor can monitor production processes, see current machine statuses, provide reports that aggregate machine data and alarm diagnostics, and support your specific application needs. In addition, staffing in this area can be a challenge as the workforce changes. Outside vendors can bring experience from resolving similar issues in other applications and deliver specific recommendations to mitigate the problem. If a potential risk is identified, you can arrange to be contacted immediately. These remote-monitoring services can be scaled to address a company’s exact needs, whether monitoring is for a single machine in a plant; several pieces of equipment; or applications, systems, and networks across multiple plants. Will this deliver relevant data or just more data? What do actual users need, want, and say? The broader picture is this: “Technology doesn’t achieve results; people do.” It’s old logic. In the right hands, technology is relevant, even critical. The same technology in lesser hands achieves nothing, or worse.